Steer Wrestling, also known as bulldogging, is a rodeo event that demonstrates strength and teamwork between a bulldogger and hazer and their horses. 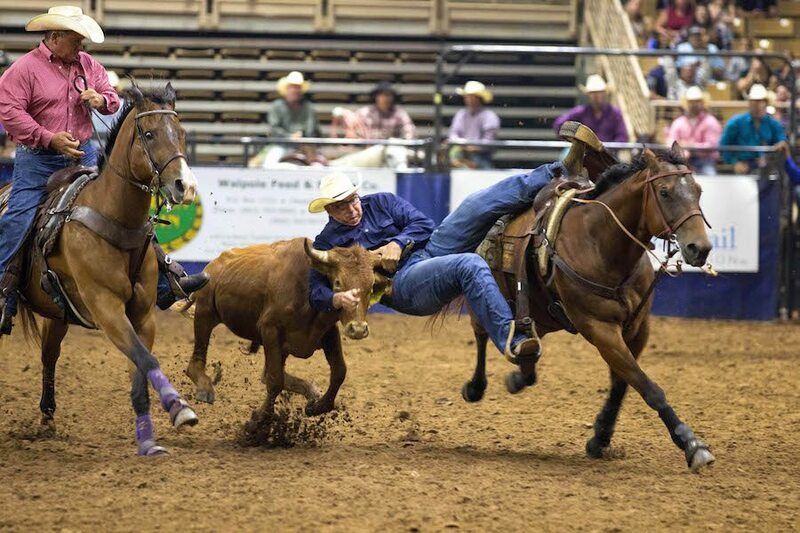 The objective of steer wrestling is to wrestle, or “wrassle,” a steer to the ground as quickly as possible. This may sound easy, but wrestling a steer is no simple task. Not only does a cowboy have to successfully grab a steer at 30 miles per hour, they then have to wrestle this steer, which weighs more than double their own weight, down to the ground. Similar to team roping and tie-down roping, two contestants enter a box with a chute in between them. Both the contestant who will wrestle the steer, known as a “bulldogger,” and his partner, the “hazer,” will start on both sides of the chute on horseback. With the steer loaded in the chute, a breakaway rope barrier is attached to the steer to make sure the steer is given a headstart. As the steer runs out of the chute, the barrier is stretched across the open end of the box. When the steer reaches the advantage point, the barrier is released and the bulldogger and hazer chase after the steer. However, if the bulldogger breaks the barrier before the barrier is released, a 10-second penalty will be added to the contestant’s time. As the hazer and bulldogger run after the steer, both cowboys work together to guide the steer closer to the steer wrestler, so he’s able to reach down and wrestle the steer. When the cowboy reaches the steer, he slides down off of his horse and hooks his right arm around the steer’s right horn, grasping the left horn with his left hand. While holding onto the steer, the cowboy digs his feet into the dirt to slow the steer down, while using his strength and leverage to wrestle it to the ground. His work isn’t done, nor does the clock stop, until the steer is on its side and all four feet are pointing the same direction. Once the steer is out of the chute, the hazer will help guide the steer toward the bulldogger to help them grab onto the steer.